I cavi XLO nascono da progetti brevettati. In vendita una coppia di cavi speakers della Xlo Signature 5.2 da 2,44mt/8ft. I cavi XLO nascono da progetti brevettati. 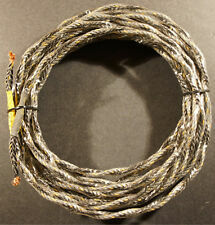 for sale a pair of speaker cables of the 2,44mt / 8ft Xlo Signature 5.2., finished by forks. In vendita un cavo power della XLO SIGNATURE 2 da 1,80mt/6ft con presa schuko e iec a 15 ampere. I cavi XLO nascono da progetti brevettati. for sale a power cable of the XLO SIGNATURE 2 from 1.80mt / 6ft with plug schuko and iec to 15 ampere. In vendita un cavo rca digitale della XLO LIMITED EDITION da 1,0mt a 110ohm. Cavo ORIGINALE, non copia cinese, con seriale n° 177 sul connettore che certifica autenticità. I cavi XLO nascono da progetti brevettati. XLO SIGNATURE TYPE 2.1 Cavo XLR 1.0 m Coppia Buono Stato F / S (d420. MPN SIGNATURE TYPE2.1. ). XLO SIGNATURE TYPE5-1 Cavo altoparlante (coppia) 1.5 m (d579. UPC Does not apply. MPN SIGNATURE TYPE5-1. ). XLO SIGNATURE 3-5.2 INTERCONNECT CABLES, 3 FEET LONG, RCA'S, EXCELLENT COND. XLO SIGNATURE 3-5.2. This pair of 3 foot long XLO SIGNATURE 3 – 5.2 interconnect cables are EXCELLENT. INTERCONNECT CABLES. DISPLAY CABLES NEVER SOLD. 3 FEET LONG. THE AUDIOCLASSIC FIVE GOLDEN RULES. 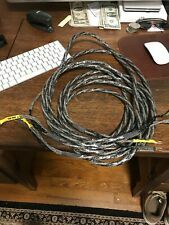 XLO/VDO Speaker Cable, SPADE Type black/yellow/gray jacket - 16 Feet. XLO/VDO Speaker Cable, SPADE Type black/yellow/gray jacket - 12 Feet. Two pairs available. Price indicated is for one pair. XLO/VDO Speaker Cable, ER-11 black/yellow/gray jacket - 29 Feet. There are more different length (up to 80 Feet.). XLO HTP12-BW - bi-wire - bananas and spades. XLO HTP12-BW - audio grade bi-wire speaker cable. Manufacturer:XLO Electric. XLO HTP12-BW. These 4N (99.994% pure) OFHC copper cables feature ultra-low capacitance LDPE insulation. Other Notes: Excellent speaker cables for the discerning audiophile looking to bring out the most clarity in high-end speakers and components. We specialize in well-cared for, previously used gear because that is what we are passionate about. XLO (before Ultralink). as I was the national XLO distributor for twelveyears retired now so you know. XLO PRO-100. RCA-RCA Interconnect Cable. Single 2M (6' 7") mono. Reference2 Ref 1A. Analog Interconnect Cable 1.0m RCA. Nice condition, RCAs are very nice, XLO technology. XLO FIRMA TIPO 2.1 Cable XLR 1.0 m Par Buen estado F / S (d420. MPN SIGNATURE TYPE2.1. Envío duración 3 ~ 14 días. ). Tadelloses XLO 4.1 B-2M-Lautsprecherkabel Unbenutztes Einzelteil Freies Verschiffen (d634. Unten finden Sie eine automatische Übersetzung ins Deutsche. Diese Gebühren sind die Verantwortlichkeit des Kunden. ). The XLO national distributorin Greece for twelve years retired now.